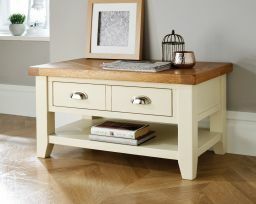 The stunning cream painted Country Cottage Oak Coffee Table with Drawer. 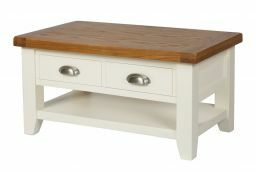 This coffee table is an excellent addition to our Country Cottage Cream Painted Range which we offer many different products in such as dining tables, bar stools, sideboards, coffee tables, TV Units and Bedroom Furniture. The Country Oak cream painted coffee table is manufactured with an American Oak top which is sourced from sustainable forests. The oak is then beautifully finished with an oiled wax which brings out the natural beauty and characteristics of the oak. Great coffee table. Excellent service from you. Highly recommend. Thrilled with coffee table. Looks fab and quality is good. Having drawers, means we can get rid of the untidy magazine rack. Brilliant coffee table. There is one large drawer and not two little ones as it looks like one the picture and it opens from both sides. That's even better. Very attractive brilliant attractive furniture particularly if it is little used and more of a feature than for lots use . Looks as good as much more expensive stuff . Drawers and interiors are lesser quality as indicated by price as little used living room furniture it looks the part. My favourite of the collection. Such a good size for the smaller livingroom. Not too cluttered. Sturdy and beautiful. The drawer is one, not two, and is one big drawer with handles on both sides of the table, so very roomy. Very pleased with our coffee table good quality have now ordered the nest of tables to match. Very pleased with the coffee table going to order nest of tables to match. Love this, can hide all the magazines, papers etc and get rid of the magazine rack. Looks great in the conservatory with the matching lamp table. Excellent,very sturdy and well made I would definitely use again. Perfect size and colour for my living room. Easy and prompt delivery as well. 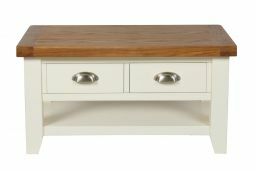 Purchased - Country-oak-cream-painted-coffee-table-with-drawers. Can't praise it enough. Order and delivery ran smoothly. Superb quality, well made, lovely piece of furniture. Will shop here again 100%. I am very pleased with my country cottage cream painted oak coffee table with drawers,which is very useful to store a lot things and the shelf is very Goode for papers and magazines.I recommend the table very highly to anyone. I am delighted with my coffee table it looks so fresh and neat. Excellent product and good vlaue for money. Whole process from placing order to delivery was excellent. With exceptional value for money, this is a coffe table which provides a stylish addition to any room. Storage is taken care of with a spacious drawer and lower shelf. High quality oak ensures the sturdiness of the item.